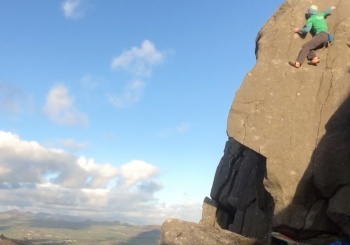 North Wales Bouldering News ::: News Details :: Rhiw: stunning new 7A! highball and more..
Video still of Owen on FA of Promised Land 7A! 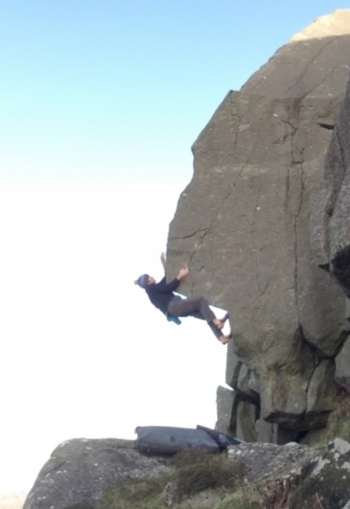 Video still of Owen on Milk & Honey 6C! 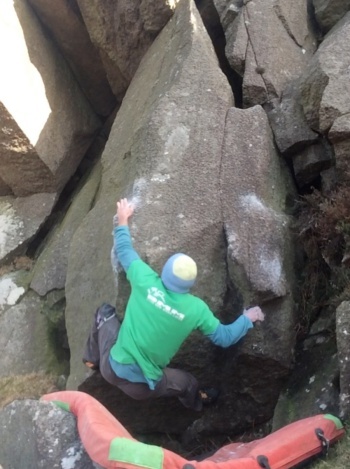 During January and February Owen Hayward has been busy climbing a brace of new problems on 'that' skyline grit-like crag at Mynydd y Graig, Rhiw (near Porth Ysgo), further up the hill from the existing Fisherman's and Pant's blocks. Mynydd y Graig is a windy and shady spot with amazingly rough rock that gives good conditions even in warm weather - a useful option if the sea level spots at Ysgo, Talfarach and Nefoedd are too warm or spray-lashed.